1/27/12 - IWAU Informer - Last night, Scott "the Wrestler" Parker returned and updated everyone that he still has 6 to 8 weeks until he can wrestle again. However, he placed a $5,000 bounty on the head of the man who shattered his orbital bone, SHaNk bArZiNi. Fans and Shank, himself, have to be asking - just who will try and capitalize on this? Also, due to the controversial conclusion to last night's Heavyweight Title match between Joey O'Riley & Matt Cage, the IWAU Board of Directors has made a decision. At "WAR" on 2/11, Cage will receive another opportunity at the title. However, it will be in a triple threat match against the other contender, Cash Bordin and the champion, Joey O'Riley! Big announcement coming out of last night's show. On Wednesday February 29th, we welcome former NWA World Heavyweight Champion Colt Cabana, former WWE superstar and member of CM Punk's Straight Edge Society Luke Gallows & former WWE Tag Team Champion Cliff "Domino" Compton to #eyewowwednesday! 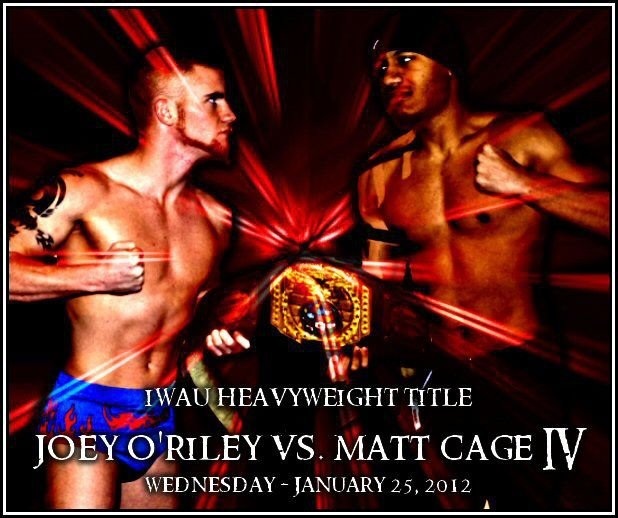 1/24/12 - IWAU Informer - Tomorrow night, Joey O'Riley defends the IWAU Heavyweight Title against the #1 contender, Matt Cage!